The Dracula Has Risen From the Grave Ultimate Guide has been lovingly researched and written by Nige Burton, Jamie Jones and Veronica Carlson, and evokes the brochure you might have bought at the cinema in 1968! There’s a thunderstorm on the mountainside, so don’t spend too much time around the castle – it looks like Dracula Has Risen From the Grave! Our Ultimate Guide to the stylish 1968 movie brings back the horror and thrills of this beloved instalment in Hammer’s Dracula series. Written by Nige Burton, Jamie Jones and Hammer legend Veronica Carlson, this magazine guide is a sumptuous tribute to a most striking movie. 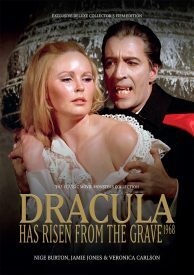 Dracula Has Risen From the Grave is a hugely popular movie among Hammer Horror fans for so many reasons – we explore the making of this compelling motion picture, as well as its legacy in the franchise as a whole. Veronica Carlson’s first-hand accounts of working on the movie bring the tale to life, making this publication an absolute essential. Printed in vivid full colour, our guide to Dracula Has Risen From the Grave is packed with information. 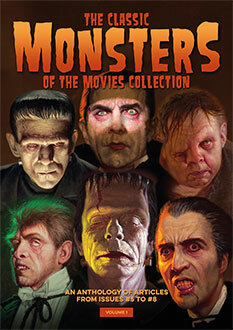 Inside you’ll find biographies on the movie’s major players from Christopher Lee to director Freddie Francis and cinematographer Arthur Grant, as well as a wealth of behind the scenes facts, stills and artwork, all compiled and designed with the style and reverence that makes Classic Monsters Ultimate Guides a must-have.